Look at that BLUE water!!!!! 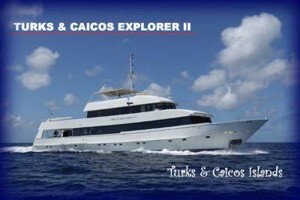 When some diver friends invited me to join them on a liveaboard trip to Turks and Caicos Islands (TCI), I was not sure how it would work out. While my wife can’t dive, she does enjoy a trip to the tropics. A liveaboard would be a bit much for her though. When some of her friends invited her for a vacation to Costa Rica in the same time frame, I was set. TCI is at the end of the Bahamas chain, north of the Dominican Republic. Arriving at the airport in Providenciales, Provo for short, was reminiscent of most Caribbean islands. The airport was small, and open. We were through customs quickly, and we were soon on a shuttle headed for the boat. We loaded our gear, and had a beer while we waited for the rest of the guests. Once they all arrived, the crew started giving briefs on the boat procedures. First we were instructed to remove our shoes and put them in a basket by the door. We would not need them for the remainder of the week. We configured our BCDs and regs on the tanks set up for us. Storage for other dive items was under the bench in tupperware like containers. That was it. You never had to remove your gear from that tank all week. Hangars were above the tanks for drying your wetsuit. There were two hot showers on the dive platform for washing off after the dive. There was a large table for cameras and tank for soaking gear. There was a additional cost for NITROX which worked out to $6 a tank. More than worth it in my book. After the crew gave us a tour of the ship, they showed us to our rooms. Each room had a full head and shower. There was a television above a small desk. a closet for hanging items and drawer under the beds. Our room was all the way forward, and looked out over the bow. At dinner that night, the captain introduced the entire crew (5), and went over the schedule and procedures and boat rules. Early the next morning, we got underway heading west for the uninhabited islands of West Caicos. Since the prevailing winds were from the east, this provided shelter from the waves. By noon we were in the water. After diving up here all summer in a drysuit and doubles, it is refreshing to jump in with so little gear. 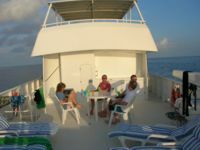 Each day the boat would move in the morning then we would do two dives. After lunch we would move again and do two more dives. After dinner we would do a night dive. The last day we snuck in a pre-dawn dive, then a morning dive before pulling back into port. The diving was very relaxed. There was little to no current. The boat was moored in the shallows about 30 yards from the wall. TCI is the top of a atoll rising from one of the deepest parts of the ocean. When I say wall, I mean WALL. Since we did two dives at each site, we would go right on one and left on the other. By the time we got back from the first dive, there would be schools of fish under the boat. This often made for interesting safety stops. To sum it all up, it was a fantastic trip! Dive. Dive. Dive. We did have a good group of divers. The captain and crew were fantastic. The cook made some great dishes. Our only complaint, was that he should have served more fish.